Mom has been looking forward to the Mamaroo baby seat review because she has high hopes this baby seat will bring a little peace to the home. The baby who helped with the review has erratic sleep patterns causing a lot of miles to be logged on the family car. Mom says: We have exhausted all of our options for soothing baby including parking her bouncy seat on top of the clothes dryer and using the white noise machine. The only thing that has worked lately is to ride her and her sisters in the car until they all fall asleep. Now to focus on the specs and technical information on the product. In the following Mamaroo baby bouncer review I will share my experience with the seat from when I took it out of the box to a rundown of the best features of the product. Ready? Alright, let’s get it out of the box and get it ready to use! I timed it and it took me less than 15 minutes to get it out of the box, chuck the packing material and have it ready to use. I put it together by myself without any help since not everybody has a helper. You will need a Phillips Head screwdriver to tighten the one, single screw. I’m not one a mom who dislikes the look of traditional baby gear but if I were, the Mamaroo would be at the top of my baby registry. I just LOVE the way that it looks and I like that it doesn’t take up as much room as the other swings we had for our older girls. I chose to try out the car ride motion for my Mamaroo bouncy seat review FIRST and first night that we tried it, she seemed confused as to why we weren’t going out for our usual sight-seeing trip and only sat in the seat a few minutes before we had to pack the kids in the car. The second night she sat in it a few more minutes by the third night, SUCCESS. I had her sisters sit on either side of her (same as in the back seat of the car) while they watched a movie and VOILA! Everybody fell right to sleep! We tried the other four motions during the day and she seems to like them fine. They do a decent job of keeping her from being fussy but just don’t make her sleepy. I’m not complaining since combined with the music, she finds the seat entertaining enough to let me get a few things done with her right there with me. The seat cover that I chose is PINK which we love around here but I like that you can buy additional seat fabrics online! I can tell that when the time comes this cover will be easy to take off and in case it gets stained maintaining its resale value! What's special about this baby mobile is that the shapes have scenes from famous paintings created by Van Gogh, Monet and Seurat! I love that the plush, stuffed balls that are positioned so that they are the last thing she sees before she drifts off into her own "Starry Night" are the works of classical artists! And just so babies can see the images very early, one side has the prints in high-contrast black and white! Very educational and cute, indeed but I do wish that it moved so that baby could see both sides. The nature sounds are calming but since we have a white noise machine, that’s not my favorite feature. What I DO like is that I can plug my mp3 player in and play whatever I want! Other MamaRoo baby seat reviews that I read indicated that the sound quality isn’t good but have no complaints since I don't care to play it so that everyone in the room can hear! This baby loves music! This is perhaps the most adjustable bouncy seat I've ever used. You can set it for pretty much any angle you like with no problem. 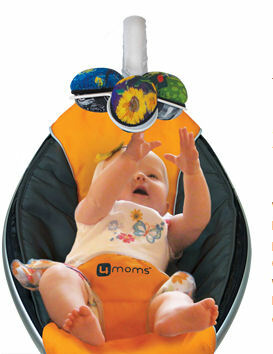 Baby can sit straight up and play with the mobile or recline to sleep. Since this baby has slight reflux, I prefer a slightly raised setting. 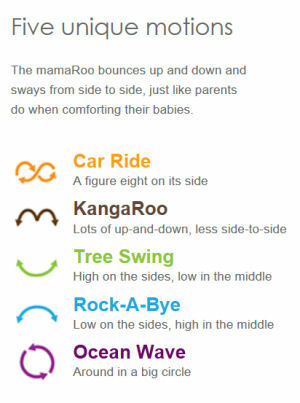 Here’s the short list of pros and cons from the Mamaroo Bouncy Seat Review. The Mamaroo doesn’t need batteries which is very eco-friendly! It has the most adjustable seat EVER! I wish it swung back and forth as well as side to side. A few years ago there were a few problems that were mentioned that most likely have been addressed. However, I feel that I should mention them for those who may be planning to save money and buy used baby gear. The final word on this baby seat indicates that the positives FAR outweigh the cons and that new moms find it very useful in keeping their little ones happy. Please take a moment to share your opinions of the Mamaroo with the moms that visit Unique Baby Gear Ideas and remember to always use your own judgment when buying items to use in the care of your newborn. This is not some useless piece of nursery equipment that is good for nothing else than to stump your toe on during 2am feedings. I found it be an excellent soother and believe it to be a worthy investment especially if you can find a used one for sale in good condition. Love the Silver Fireworks pattern! Totally want one! I like the paint dots design best. The green one is great! I like the green one! It is awesome! I like Unique Baby Nursery Decorations on FB (Sarah Smile) and I would choose the Green Jacks. and i like the color Paint Dots..
Would love a mamaroo baby seat! I like the Green/Chocolate colors. I like the paint dots color. I 'like' Unique Baby Nursery Decorating Ideas on Facebook. Wow what a great giveaway! I decided to not spoil the surpise of what my lil pea pod is gonna be thus I think that is the best pattern (silver fireworks) love love! I like the bright green one. I liked on Facebook. signed up as 4moms insider! Like Unique Baby Nursery...on FB, and I would pick the Paint Dots design because it is so cheerful. I need this and all help I can get. I am a first time mom who is doing it solo. It's just me and my baby girl (expecting in march) I have not been able to afford anything. All help is appreciated. The green Jacks print is my favorite. What an awesome baby product! Subscribe to Baby Gear Reviews on Youtube. I love the Paint Dots design! I LIKE THE BLUE CLOUDS MAMAROO AND I LIKE Unique Baby Nursery Decorating Ideas on Facebook. i love the blue clouds mamaroo and i like you on facebook! Ive never seen anything like it. Its amazing and I want one so bad. I need a neutral color cause i dont know what im having yet. Im trying to enter to win one and not sure how. Please help me? I like unique baby gear ideas on Facebook and love the silver fireworks! I would love to win this for my little one! Thanks so much for the fantastic giveaway! I love the paint dots design!! Would love this to try for my new bundle of joy expected on Thanksgiving!! I've never had any "mamaroo" products but they look awesome!! I love the Mamaroo in GreenJacks. I LIKE Unique Baby Nursery Decorating Ideas on Facebook. I like the Green Jacks color Mamaroo AND I LIKE Unique Baby Nursery Decorating Ideas on Facebook. I would love any color MamaRoo - but I like the plush blue clouds best. I voted for the Modern Gray and White Nursery. Posted a link to Baby Shower Decorations blog on mine. Posted a link to your baby blog on my blog. I Like Unique Baby Nursery Decorating Ideas on Facebook. I have one of the 2010 models and a friend of mine has the 2011 model and it's lots nicer than mine so I would like to win one of the new ones for my baby who is due in a few months. Also, I would like to warn people that if they are buying online, they should be sure they are getting the newer model (unless they are getting a deal because my 2010 model has worked fine for me). Here's how you know if your seat is the newer model. Open the box and check to see if the safety harness has the NEW or OLD logo. The old logo is displayed in two colors and has four dots over the "O". The new logo is in one color and the number "4" is framed in a square. Another way to tell is to look at the number next to the bar code on the outside of the box which is practically invisible in some cases. If you can make out the numbers, you will see the date of manufacture in a YYYYMMDD format. Be sure that the date reads 2011XXXX rather than 2010XXXX. Blog Facebook fan Christine Lopes. I like you on Twitter, and I Tweeted about this giveaway. I'm following 4moms on Twitter. I also have been a fan of you on Facebook, but I forgot to mention that in my first entry! Already signed up for 4moms Insiders. Not sure if it is under dmorris1264@carolina.rr.com or sonyamorris@carolina.rr.com. Following 4moms on Twitter as catholicfanatic. Visited Mamaroo and I love the Paint Dots Plush Mamaroo (honestly I would love any of them).